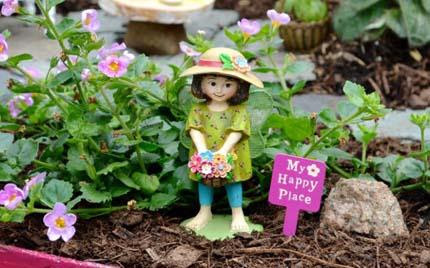 The Garden Is my Happy Place! 09 Jun The Garden Is my Happy Place! June is in full bloom everywhere I go. At Natureworks, I am astounded by the gardens, they are so lush and brimming with color. Peonies and Baptisias are stealing the show this week, and I find myself wandering around, soaking up the beauty, instead of going home to rest after a long day. With June comes the time to do some serious pruning in the garden. Last week I gave two walks about cutting back perennials. Click here to link to the handout on this subject, which also includes deadheading, something we are starting to do with our early spring bloomers. As I say to my crews: “If you are not leaving the garden with tarp loads of debris, you are not cutting your plants back enough!”. This week I am focusing on pruning woody shrubs, specifically “The June Prune“. This is all about pruning the spring blooming shrubs that flower on last year’s wood. They will be setting up their buds for next year very soon, the time to prune them is NOW. This includes Rhododendrons, azaleas, lilacs, quince, Deutzia, many Viburnums, bridal wreath Spireas, and anything else that has flowered already. The walks will be Thursday evening from 5-6 and Saturday morning at 9:30. We will begin with a demonstration on how to sharpen your pruners, a must if you are doing some serious pruning. The questions continue to come in regarding hydrangeas. Yes, I will talk all about them at the pruning workshops. There are so many different kinds. Hydrangea macrophylla and serrata species really took a hit from the winter and lost most of their old wood. 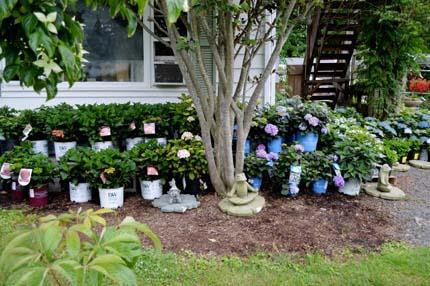 We are well stocked with the newest varieties of reblooming hydrangeas that will bravely bloom on new wood this year. 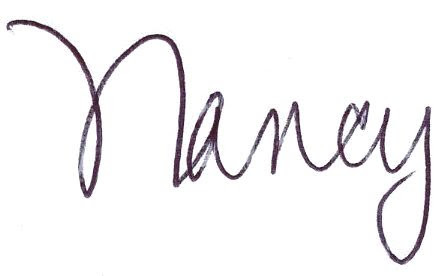 Is it time to switch yours out and end the agony that winter often brings? 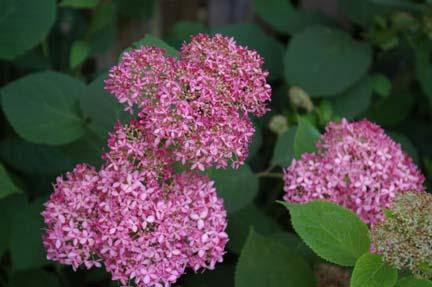 I am leaning more and more towards Hydrangea arborescens and Hydrangea paniculata varieties. 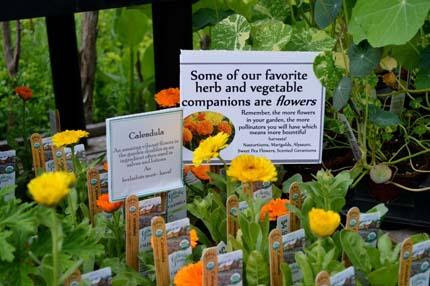 These have NO issues with hardiness as they bloom off of new wood and are totally reliable, no matter how cold our winter is. Hydrangea ‘Invincibelle Spirit’ is completely hardy and a reliable bloomer each year. In my garden I grow Hydrangea arborescens ‘Invincibelle Spirit’, the PINK form of our native ‘Annabelle’ hydrangea. She is paired with a purple smokebush and has never missed a year of blooming since I planted her. 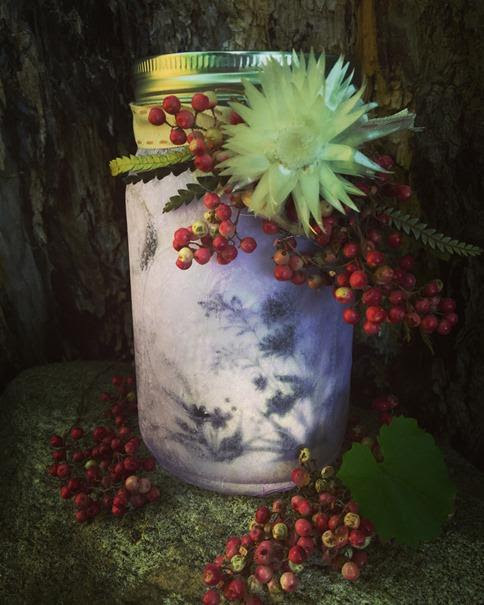 This Sunday we are having a Grow Organic Kids and Teens event –Making Mason Jar Lanterns. This is a new, fun workshop. Please read all about it in the Upcoming Eventssection below and register today. We continue to be fully stocked with organic vegetable seedlings. Many of us are still planting; some are just starting! If you plant with the moon phases, next week is the time to plant above ground flowering plants again. With ample rainfall, sunny temperatures, and gorgeous weather ahead, continue adding edibles to your gardens and landscape. Don’t have a dedicated veggie garden? No problem. Tuck pepper plants into your perennial beds. Fill some Smart Pots with organic potting soil and plunk them down where you have some sun. I grow food in containers and in the ground. I plant constantly and harvest daily right up until Thanksgiving. Got veggies? Got herbs? We do! We continue to be fully stocked with all kinds of organic edibles. 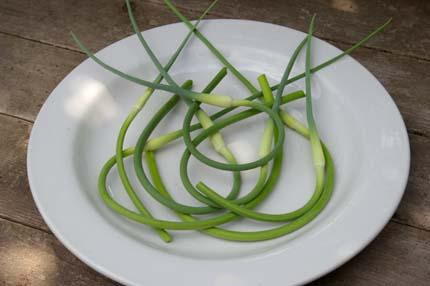 Garlic scapes- the harvest is starting! and in June it tries to flower. The flower buds are called scapes. You must cut them off as they will take energy from the heads of garlic forming below ground. They are a gourmet delicacy, delicious made into pesto, grilled, or stir fried. I love a crop that is easy to grow and gives you two different harvests. Garlic I harvested last year is long gone- it is a delight to be able to cook with garlic scapes right now. As the spinach finishes and I harvest the early radishes and lettuce, I open up room for planting seeds of the next round of edibles. 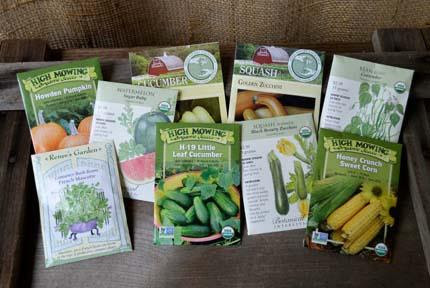 Cucumbers, squash, beans, and baby watermelons are just a few of the SEEDS that you can plant right now. Seed packets tell you how many days till harvest. As of June 8th, we have at least 90 or more frost free days in our growing season! I must admit many of my raised beds aren’t planted yet. They LOOK planted as they are filled with self-sown Arugula (from last fall’s crop), borage, poppies, and sunflowers. But the main bulk of putting in my summer crops is still awaiting a day off when it isn’t raining or I don’t have to go out of town to give a talk or I am just too exhausted to lift a finger. Thank goodness spring is long and June is such a great month to plant. 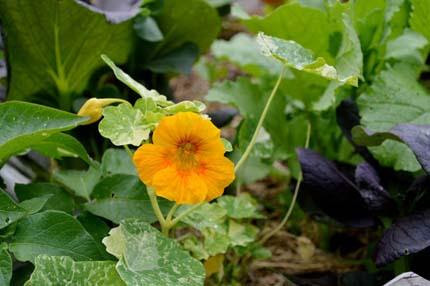 Edible Nasturtium flowers are a wonderful source of vitamin C.
mint (Pycnanthemum muticum) assures that every pollinator in the neighborhood visits my garden. I allow lemon balm, mint, chervil, and fennel to thrive among the perennials. 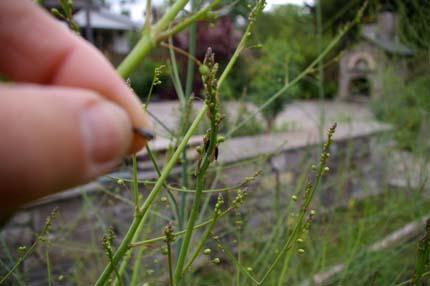 I am currently watching many Eastern black swallowtail caterpillars develop and grow before my eyes. I encourage daisies to grow near my edibles as well- they attract many beneficial insects. We call this a BLENDED GARDEN. Others refer to it as an EDIBLE LANDSCAPE. At Natureworks, we call it Plants with a Purpose. Yes, my garden is lush and beautiful but every plant in it serves an ecological function to enhance the habitat. 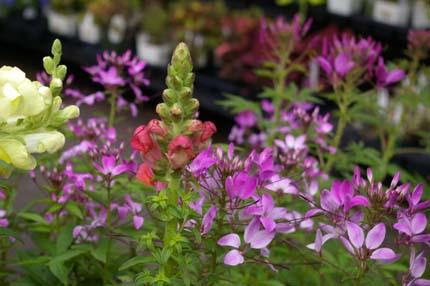 Snapdragons, Cleome, zinnias, sunflowers and other old fashioned annuals can be planted now from seed or starter plants. They enhance the habitat for pollinators and beneficial insects in your landscape. 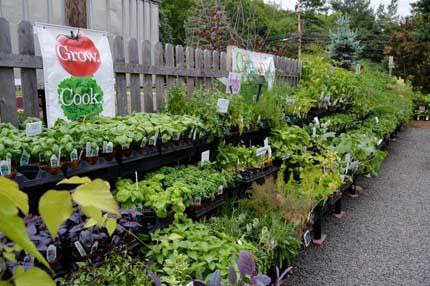 With the rain that we had, it’s time to feed your containers, your early vegetables, and your annuals. We use Neptune’s Harvest Rose and Flowering formula for annuals in containers and all hanging baskets. For the veggie garden, you can use Neptune’s Harvest Fish and Seaweed combination or sidedress the garden with Coast of Maine Organic Plant Food. Kelp (seaweed) is an important part of all of these formulations. It helps the feeder roots to grow strong, and that makes for a very healthy, stress resistant plant. So what’s the highlight of your early June garden? I am sure you too are surrounded by nature’s beauty and find it hard to go to work or to go inside at the end of the evening. These are the glory days of the garden, as we approach high summer, the solstice on June 20th. Monday night I gave a talk to the Glastonbury Garden Club and it was still light out as I drove home at8:15. Soak up every minute you can, and be sure to make some time to come and visit.